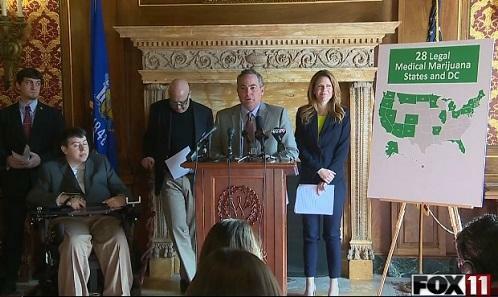 MADISON (WLUK) --- Democratic state lawmakers are looking to legalize medical marijuana. In Madison Monday, State Representative Chris Taylor and State Senator Jon Erpenbach laid out a plan that will need Republican support to pass. "Most of these are still full," said Steve Acheson, showing off a number of prescription pill bottles. Acheson, a veteran, says he suffers from PTSD and has had several surgeries related to his service.